These cookies are probably as simple as you can get. It uses one bowl, so easy clean up and only uses a few pantry friendly ingredients! They come together in a snap. Whisk together the dry ingredients: Powdered sugar, cocoa and salt. Then add in the eggs, this is where you need a bit of are strength. I suggest using a whisk at first to help break up the egg. Then switch to a rubber spatula or wooden spoon to really get the batter mixed thoroughly. It's a thick sticky batter since there's no other liquid besides the eggs. Once the batter is combined, add in the mix ins! I used pecans, chocolate chips and broken up pretzels. Using a medium sized cookie scoop or two large spoons, scoop the batter 2 inches apart onto a parchment lined baking sheet. Bake at 350F for 14 minutes or until the tops of the cookies are shiny and dry. 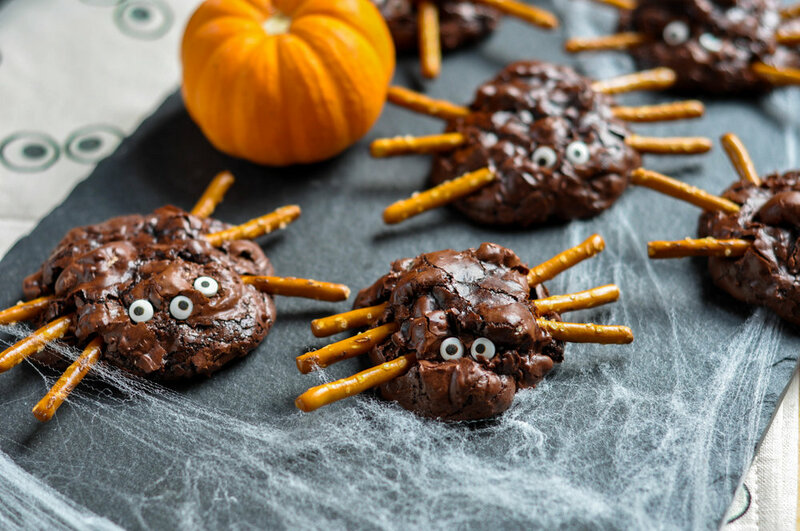 Once they come out of the oven, carefully stick the pretzel sticks into the side of the cookies and dot with as many candy eyes as you can fit. Do not wait for them to cool as they will become too brittle to push the pretzels in! Once cooled the pretzels will be pretty stable in their new cookie body! These really brought such a smile to the kids faces. They couldn't wait to grab one! Plus the cookies are seriously delicious. They're like a brownie with a rich chocolatey nutty surprise inside. You'll want to make these just for yourself! Add in eggs and egg whites. Mix with a whisk or large spoon till thorough combined. The batter will be quite thick. Fold in pecans, chocolate chips and crushed pretzels. Scoop the batter into mounds into a parchment lined baking sheet. Bake for 14-16 minuets or until the tops are dry and shiny. Once out of the oven carefully place three pretzel sticks on each side of the cookie and as many eyes as you like!